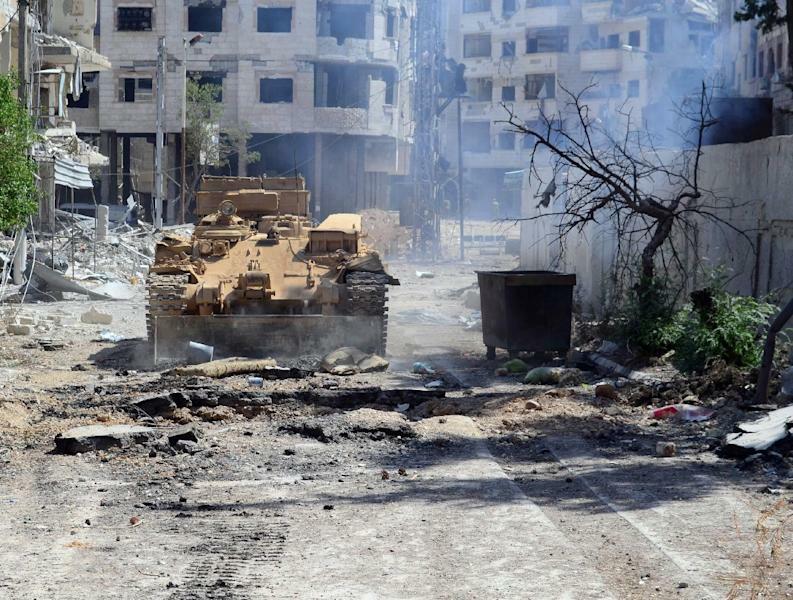 Damascus (AFP) - Syrian government forces on Thursday retook a key town on the outskirts of the capital Damascus after a months-long battle against rebels, a military source and state television said. The Syrian Observatory for Human Rights monitoring group backed up the report. "The army, with the cooperation of the National Defence Forces (militia), has accomplished its mission of restoring stability and security to Mleiha," the army command said in a statement. It added that troops carried out "a series of crucial operations killing a large number of takfiri (Islamic extremist) mercenaries who had barricaded themselves in the town." "This is a tough blow to the takfiri terrorists who have begun to fall in the face of the successive blows dealt to them by the army," it said. The army said Mleiha would now serve as a springboard for its bid to regain control of Eastern Ghouta, an important rebel bastion outside Damascus that has long been in the sights of government forces. State television broadcast live from Mleiha, showing streets with holes punched through homes by rockets and twisted metal from telephone line poles. Mleiha lies southeast of the capital and has been a key flashpoint in fighting around Damascus. The area has been under siege for more than a year, and under near-constant bombardment by government forces. The chief of Syria's air defence forces, General Hussein Isaac, was killed in fighting there in May. "Taking back Mleiha would allow the regime to protect parts of Damascus from rebel rocket fire on the capital," Observatory director Rami Abdel Rahman said. "It is also the gateway to Eastern Ghouta," he added. While the government retains firm control over Damascus, rebels have several rear bases around the city, from which they regularly launch rockets. The Observatory said two people were killed as rebels fired mortar rounds at Damascus on Friday, while eight children and eight other people were killed in regime air strikes using barrel bombs in the rebel-held city of Rastan, central Syria. Elsewhere, Islamic State (IS) jihadists beheaded at least nine opposition fighters on Wednesday night in Akhatarin, after seizing several northern villages, it said. The Britain-based Observatory, which relies on a network of activists and medics on the ground, also said regime forces staged multiple air raids in northern Raqa province against IS positions, especially around Tabqa airport, the last military site held by the regime in the province. The monitoring group said 100 Syrian soldiers and officers arrived at the airport on Thursday after fleeing the Division 17 base in the same province when it was captured by IS on July 25. 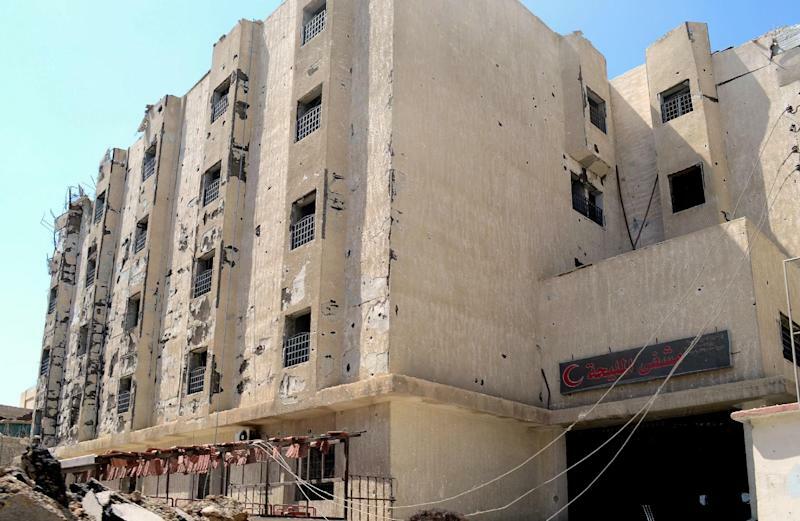 They had been hiding in "civilian homes" in Raqa, the Observatory said. IS grew from Al-Qaeda's one-time Iraqi branch and originally fought alongside Syria's rebel groups, but it has been denounced by Al-Qaeda's leader and other opposition groups have turned against it. In January, a coalition of Islamist and moderate opposition fighters began battling IS, forcing it to retreat for a time to its stronghold in Raqa province. But with the capture of large swathes of Iraqi territory across the border as well as heavy military equipment, the group has since managed to regain some lost ground in Syria.